How is tempered glass made - Tempered Glass Looking for Tempered Glass? Tempered glass is about four times stronger than "ordinary," or annealed, glass. And unlike annealed glass, which can shatter into jagged shards when broken, tempered glass fractures into small, relatively harmless pieces. As a result, tempered glass is used in those environments where human safety is an issue. Applications include side and rear windows in vehicles, entrance doors, shower and tub enclosures, racquetball courts, patio furniture, microwave ovens and skylights.To prepare glass for the tempering process, it must first be cut to the desired size. (Strength reductions or product failure can occur if any fabrication operations, such as etching or edging, take place after heat treatment.) The glass is then examined for imperfections that could cause breakage at any step during tempering. An abrasive¿such as sandpaper takes sharp edges off the glass, which is subsequently washed. Next, the glass begins a heat treatment process in which it travels through a tempering oven, either in a batch or continuous feed. The oven heats the glass to a temperature of more than 600 degrees Celsius. (The industry standard is 620 degrees Celsius.) The glass then undergoes a high-pressure cooling procedure called "quenching." During this process, which lasts just seconds, high-pressure air blasts the surface of the glass from an array of nozzles in varying positions. Quenching cools the outer surfaces of the glass much more quickly than the center. As the center of the glass cools, it tries to pull back from the outer surfaces. 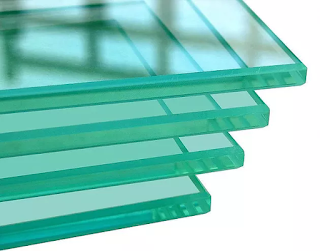 As a result, the center remains in tension, and the outer surfaces go into compression, which gives tempered glass its strength.Glass in tension breaks about five times more easily than it does in compression. Annealed glass will break at 6,000 pounds per s quare inch (psi). Tempered glass, according to federal specifications, must have a surface compression of 10,000 psi or more; it generally breaks at approximately 24,000 psi.Another approach to making tempered glass is chemical tempering, in which various chemicals exchange ions on the surface of the glass in order to create compression. But because this method costs far more than using tempering ovens and quenching, it is not widely used.